Yeah, baby. I own this town. Okay, so this one here? This one is Jim. Jim lets me walk across the intersection at Canal and Quincy whenever I want, wherever I want. 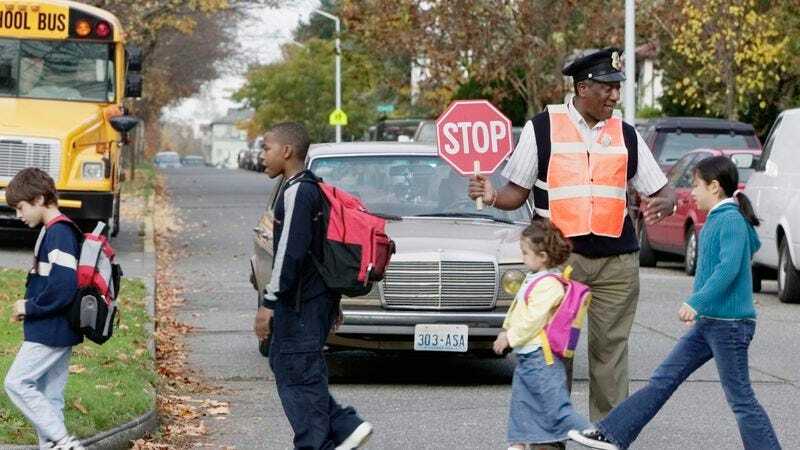 All it took was buying him a coffee once, and boom—instant control over all school zones. If I want to take a nice little jog when student drop-off or pickup is happening, I call Jim, and he clears it for me, no questions asked. Next up, we’ve got Harold, who works the seven-to-nine shift on Montrose. When it comes to weekdays during commute hours, I have Harold eating out of the goddamn palm of my hand. How did I do it, you might ask? Well, I give him one medium-quality Christmas gift every year, and now, let’s just say that when I use the crosswalk, Harold doesn’t let anyone walk with me. I am the chess master, and Harold is my tiny pawn. Four words, baby: Buddy is my boy. Buddy has said this on multiple occasions, but if I ever have beef with anyone, all I need to do is give him a call, and he’ll never let them cross his crosswalk again. I told Buddy I liked his vest one time, and ever since then, the intersection of Orchard and Myrtle has belonged to none other than this guy. So, I don’t want to shoot my wad on this, but if I wanted to, I could totally borrow her whistle at any point. Well, Susan has a weakness for men with an in-depth knowledge of city zoning laws, and yeah, baby—I’m that guy. Honestly, she’s so hot for me that, between her and the last four, if I lined them all up, I could have five unobstructed blocks of the city that I could run up and down with no interruptions. I’m not saying I’ll ever flex this muscle, but it sure is sweet to know that I could. I’ve been buttering up Carlos for years, slowly but surely. I started working him the day I moved here when I gave a thumbs-up to his stop sign, and I’ve been ramping it up ever since. I’ll say this much: Carlos hasn’t been much help to me yet, but one day, he’s going to get me in with the crossing guard community one town over where his girlfriend’s family lives. One day, I want to have enough control to stop a parade. Oh, hell yeah: Ellen. Ellen says I can pick any two cars I like and she will make them crash for me. This is not a favor Ellen’s gonna do for just anyone, you know. It’s good to have this in my back pocket in case Buddy or Susan gets out of line and I need to remind them who the boss is. And lastly: “the chief.” The chief is my white whale. The crossing guard to catch. Best-case scenario, I find a way to get through to him and gain control of the parking lot at the lake on Saturdays. Worst-case scenario? It backfires, and he turns all the other crossing guards against me, and I can never drive or walk in this town again. Either way, though, I’ve gotta try. I want every single one of them, and believe me, goddamn it, I’ll get ’em.